The status of a Buddha cannot be determined by Bodhisattvas. Ordinary people are all the more incapable of making such a determination. However, certain evil people have slandered H.H. Dorje Chang Buddha III by saying He conferred upon Himself the status of a Buddha, and they have thereby guided Buddhist practitioners toward evil. There are even those who are so lowly they used their authority to urge people of great virtue not to admit that they wrote recognitions for H.H. Dorje Chang Buddha III, when in fact those people of great virtue did write such recognitions. In order to benefit living beings by ending their confusion and their generation of negative karma through slander, in order to avoid these pitiful living beings descending into the three lower realms, H.H. Dorje Chang Buddha III made a serious and consequential vow of truth about this matter of recognitions. Based on these karmic conditions, International Buddhism Sangha Association has obtained and is making public the list and photographs of sixty dharma kings, regent dharma kings, and rinpoches from each of the main sects of Buddhism who recognized that Master Wan Ko Yee is the true incarnation of Dorje Chang Buddha, the primordial ancient Buddha. Due to space limitations, the recognition certificates that they wrote cannot be published here but are published in the book Brief Introduction to H.H. Dorje Chang Buddha III. Thus, we now clearly and formally announce to the world that H.H. Dorje Chang Buddha III has been recognized as the third incarnation of Dorje Chang Buddha in accordance with the dharma. H.H. Dorje Chang Buddha III is not a false rinpoche who conferred upon Himself the title of Buddha! Actually, whether one is a Buddha or not depends upon whether one has the enlightenment level and accomplishments of a Buddha. The same is true for H.H. Dorje Chang Buddha III, who deserves the title of Buddha because of His enlightenment, accomplishments, more than 2,000 discourses on the dharma, and His manifestation of wisdom. His accomplishments in thirty large categories as documented in the book H.H. Dorje Chang Buddha III are manifestations of wisdom that no other holy being in history can match. No other leader of Buddhism has the wisdom of a Buddha. Conservatively speaking, no other leader of Buddhism has attained even one third of the achievements H.H. Dorje Chang Buddha III has attained. This is a fact. No other person in all of Buddhism can match Him. This is the same with respect to Sakyamuni Buddha, who deserves the title of Buddha based upon possessing the enlightenment and accomplishments of a Buddha and based upon expounding the sutras. Sakyamuni Buddha would still be a Buddha even if nobody recognized Him as such. Recognition certificates written to a Buddha indentifying Him as a Buddha are worthless sheets of waste paper as far as a Buddha is concerned. That is because the level of enlightenment and accomplishments of those who wrote such certificates is so much lower than that of a Buddha. It would be like the sixteen arhats recognizing that Sakyamuni Buddha is a Buddha. As far as a Buddha is concerned, the purpose of such certificates is insulting. However, as far as living beings are concerned, such recognition certificates are beneficial because living beings have blind faith in man-made traditions. Thus, our Association received certificates recognizing the identity of H.H. Dorje Chang Buddha III in order to respectfully comply with the Tibetan Buddhism system of recognizing rinpoches. The greatly virtuous ones who write those recognition certificates did so based upon correct understanding and correct view, bringing them both joy and merit. Nonetheless, there are certain individuals who do not know H.H. Dorje Chang Budhha III yet who create negative karma by slandering Him. They judge H.H. Dorje Chang Buddha III to be a bad person, an unholy person who conferred upon Himself the title of Buddha. Their judgment is based solely on the filing of a case against H.H. Dorje Chang Buddha III at Interpol by a member country of Interpol requesting that an arrest warrant be issued against H.H. Dorje Chang Buddha III. We suggest that these ignorant people understand this matter from the perspective of Buddhist history. When Sakyamuni Buddha was living in this world, wasn’t He also slandered and consequently regarded by some as a bad person? When Guru Padmasambhava entered Tibet to spread the dharma, he was regarded as an evil person and was thrown into a mud pit! False charges were also made against Christ, who was even nailed to the cross! Is there a shortage of holy persons in history who were accused falsely or slandered? History books are full of such examples. An order to arrest someone does not mean that he or she actually committed a crime. So many good people in the world have been treated unjustly. So many good people in the world have been falsely accused. So many famous politicians in history were labeled as bad people a few times in their lives, but they later proved to be magnificent people. Examples of this kind are countless. Therefore, those who judge whether one is good or bad based upon public opinion or how things appear on the surface are clearly ignorant, unkind people or are false monastics with evil views. H.H. Dorje Chang Buddha III is, of course, the incarnation of the primordial ancient Buddha of Buddhist history. Thus, He naturally is the highest leader of all of Buddhism. However, certain leaders of Buddhist sects cannot let go of their desire to save face. Out of jealousy they slander H.H. Dorje Chang Buddha III and attempt to destroy Him. In so doing, they lose their bodhicitta and cast aside the essence of religion—acting for the good of others. Nonetheless, H.H. Dorje Chang Buddha III just silently accepts the various forms of praise or blame directed at Him as He continues to carry out Buddhist matters that benefit living beings. “H.H. Dorje Chang Buddha III, recipient of the World Peace Prize – Top Honor Prize, has been recognized by all of the major Buddhist sects around the world as the highest leader of Buddhism in history. More than 60 rinpoches issued documents attesting that H.H. Dorje Chang Buddha III is the true incarnation of Dorje Chang Buddha. More than 20 of those rinpoches are dharma kings or regent dharma kings with the highest authority to recognize the identity of someone. Such a large number of recognitions is unprecedented in the history of Buddhism. The following individuals wrote recognitions, corroborations, or congratulations to H.H. Dorje Chang Buddha III, affirming His status as the third incarnation of Dorje Chang Buddha and holder of the highest position in all of Buddhism: H.E. Dharma King Gongbao Dumu Quji, the yidam-dharma initiation Master of the 17th Karmapa; H.E. Goshir Gyaltsab, a regent dharma king and National Master who taught the sixty volumes of sutras to the Karmapa; H.H. Sharmapa, a regent dharma king; H.H. Dharma King Trulshik, H.H. Dharma King Taklung Tsetrul, and H.E. Chogye Trichen, all three of whom are Masters of the Dalai Lama; as well as those whose positions in Buddhism are even higher, such as H.H. Dharma King Dodrupchen, the sole holder of the rainbow body accomplishment dharma; H.H. Dharma King Penor, the third supreme world-leader of the modern Nyingma sect; H.H. Dharma King Achuk, the pre-eminent holy virtuous one in present-day Tibet; H.H. Dharma King Jigme Dorje, the supreme leader of the Jonang sect; etc. H.H. Dorje Chang Buddha III is the pre-eminent rinpoche, a Buddha who has received more recognitions than any other great rinpoche or Buddha in the last few thousand years! “For a long period of time, H.H. Dorje Chang Buddha III has undergone political and religious persecution and has experienced tremendous pressure. Interpol received a request from one of its member countries to issue a warrant for His arrest. Three years later that member country voluntarily applied to Interpol for the withdrawal of the arrest warrant issued against H.H. Dorje Chang Buddha III. After a long-term investigation, Interpol came to the correct conclusion. In October of 2008, the 72nd Session for the Control of Interpol’s Files withdrew the arrest warrant and the entire case against H.H. Dorje Chang Buddha III. Interpol also issued a formal written notification stating clearly that the arrest warrant against H.H. Dorje Chang Buddha III has been formally withdrawn and all of its member countries have been notified of the withdrawal. “Although H.H. Dorje Chang Buddha III had long ago received written notification of the withdrawal of the arrest warrant and the entire case, He has never shown such documents to prove His innocence no matter who slandered Him and no matter how He was slandered. When the World Peace Prize Awarding Council found out about this, it asked H.H. Dorje Chang Buddha III why He had not disclosed such ironclad evidence that was so beneficial to Him in order to refute rumors circulating in society. He responded by saying what He must do is bear all of the karmic offenses committed by living beings and give to living beings all of the good karma and merit that He has planted. He said that if He proved His innocence by showing those documents, then those who slandered Him would no longer be seen as innocent. Who, He asked, would bear their karmic offenses? In September of 2005, in response to an application of a member country, Interpol placed the case against H.H. Dorje Chang Buddha III on file for investigation. After an extremely serious and detailed three-year examination, in October of 2008 the 72nd Session for the Control of Interpol’s Files justly decided to withdraw the case and arrest warrant against Him. H.H. Dorje Chang Buddha III is like gold that had been tempered inside the cauldron of Interpol for three years, ultimately emerging just as pure and even more radiant than before! He even received the World Peace Prize. Is He a bad person or a good person? He is a holy and pure Buddha! Those who lack roots of goodness, who judge whether someone is a holy being or an ordinary person based on the outward appearance of things, are confused and foolish. They are what Buddhism calls living beings with roots of ignorance. Now is the time for them to awaken. Actually, a Buddha is a Buddha. The cancellation or non-cancellation of an arrest warrant has nothing to do with proving the essence of Buddhahood. One day in the past a person was viewed as innocent. Today that same person is falsely charged. Tomorrow he shines brightly. Could it possibly be that a Buddha who is falsely charged loses the essence of Buddhahood? Could it possibly be that one who shines brightly in the eyes of others is necessarily a holy being? Of course not. H.H. Dorje Chang Buddha III does not harbor the slightest anger or hatred toward those who slander Him. Rather, He regards all ill-wishers as His own family members, His own father or mother. He benefits them. He prays that they stay far away from all suffering, that they attain happiness. The conduct of H.H. Dorje Chang Buddha III shows us that He disregards the blind slander and harmful actions directed at Him by living beings. All that He thinks of is benefiting living beings, giving living beings all of His merit, and bearing the karmic offenses of living beings. He is not the least bit angry or resentful toward those living beings who commit the karmic offense of smearing Him. He does not think about how to clear His name from the harmful slander He has undergone. Rather, He thinks about the need for someone to bear the karmic offenses of those who slander Him. He thinks that if He does not bear the karmic offenses of the slanderers, who will? The key point is that H.H. Dorje Chang Buddha III is not concerned with either honor or disgrace. He is not stained by the ways of the world. His moral character is lofty. How could words describe such a state? When we look inside ourselves, we feel very ashamed in comparison. Although we are learning Buddhism, we are unable to reach the holy state of His conduct and moral character. Buddhist monastics cannot even attain one percent of such a holy state. It is no wonder that H.H. Dorje Chang Buddha III, the incarnation of the primordial ancient Buddha, is a model for Bodhisattvas and holy beings in all the heavens to emulate. Over these past years, people who have judged and slandered H.H. Dorje Chang Buddha III based on the outward appearance of things have accumulated so much dark karma! The truth tells us that judging whether someone is an ordinary person or a holy person definitely cannot be based upon the outward appearance of things that have happened. The key is to look to the person’s conduct, moral character and wisdom rather than just accepting empty, baseless opinions. Any opinion or reasoning can be fabricated based on falsehoods, but wisdom and realization cannot be fabricated. People whose wisdom and realization are lower than those of a Buddha cannot determine whether one is a Buddha or not. However, in order to benefit living beings, our Association puts forward the following three items evidencing the fact that a Buddha has come to our world. First, it is required that mastery of the Five Vidyas be manifested to show one’s wisdom and realization in Buddhism. The Five Vidyas are the logic vidya, the sound or speech vidya, the inner vidya, the healing vidya, and the craftsmanship vidya. Mastery of all five is indispensible. H.H. Dorje Chang Buddha III has truly accomplished wondrous mastery of all Five Vidyas without exception. He has singlehandedly attained accomplishments in thirty different large categories, making Him an unprecedented milestone figure in the history of the Five Vidyas. (Please see the book H.H. Dorje Chang Buddha III) This provides a model unique in all the world for others to emulate. No rinpoche, dharma master, or Buddhist leader in the entire world has attained even one third of His accomplishments. Moreover, no rinpoche, dharma master, or Buddhist leader is even able to duplicate His “Yun Sculptures,” which is just one aspect of the craftsmanship vidya. We all know that the wisdom of a Buddha is certainly unsurpassed. Thus, if H.H. Dorje Chang Buddha III is a false Buddha, doesn’t that mean that the wisdom and accomplishments of such a false holy one actually surpass those of the Buddhas and Bodhisattvas? Doesn’t that mean that the wisdom of the Buddhas and Bodhisattvas cannot match the wisdom of such a false holy one? Second, the status of all rinpoches is determined according to the system of Tibetan esoteric Buddhism used to recognize reincarnations of rinpoches. The status of H.H. Dorje Chang Buddha III was recognized and established according to the system of Tibetan esoteric Buddhism used to recognize rinpoches. H.H. Dorje Chang Buddha III has received more recognitions and corroborations of status from dharma kings and regent dharma kings of all of the main sects of Tibetan esoteric Buddhism than any other great holy one in the history of Buddhism. No other rinpoche has received that many recognitions. If H.H. Dorje Chang Buddha III is a fraud, then the Dalai Lama and the Karmapa are not true rinopches, and there are no true rinpoches in all of Tibet, India, and anywhere else in the world! That is because not one of them has received even one third of the recognitions and corroborations of status that H.H. Dorje Chang Buddha III has received. Furthermore, the accomplishments of these other people of holy virtue in the Five Vidyas are far inferior to the accomplishments of H.H. Dorje Chang Buddha III in the Five Vidyas. They have not even attained one third of the accomplishments H.H. Dorje Chang Buddha III has attained in thirty large categories. If one who received the most recognitions of status from authoritative figures within various sects is a false rinpoche, then is one who received a small number of recognitions a true rinpoche? If masters of rinpoches really did write false recognition certificates to deceive people, then they are deceivers rather than holy ones. False holy ones are unable to transmit true dharma. Wouldn’t that mean that their rinpoche disciples learn the false dharma of a deceiver? Wouldn’t the yidam dharma that H.H. Dharma King Gongbao Dumu Quji transmitted to the Karmapa be false dharma? Would H.H. Dharma King Gongbao Dumu Quji write a false document to deceive others? Would dharma kings or regent dharma king such as H.H. Sharmapa, H.E. Goshir Gyaltsab, H.H. Trulshik, H.H. Taklung Tsetrul also write false recognition certificates to deceive people? If they wrote false recognition certificates to H.H. Dorje Chang Buddha III, then wouldn’t all of the recognition certificates they wrote for other rinpoches be false as well? Hence, if even H.H. Dorje Chang Buddha III is a charlatan, then aren’t all of the rinpoches in the entire world also charlatans? But those people are true holy ones. They are masters of the Karmapa or the Dalai Lama. If all of them are charlatans, then what about their disciples? H.H. Dharma King Achuk, H.H. Dharma King Penor, H.H. Dharma King Jigme Dorje, and H.H. Dharma King Jigdal Dagchen recognized the status of many rinpoches. It couldn’t possibly be that all of them were reckless and irresponsible in the writing of those recognition certificates! If they were, wouldn’t all of those recognized rinpoches be false rinpoches? Third, H.H. Dorje Chang Buddha III has personally initiated and transmitted dharma to disciples of His, which include inner-tantric initiations. There are numerous examples of His disciples predicting the time of their own deaths, coming back to life after passing away, passing away in a state of liberation while sitting in the cross-legged lotus posture, leaving behind sarira relics in their bodies after they passed away, attaining the state of a body that does not decay after death, and transforming into a rainbow light at the time of passing. Those who were initiated by H.H. Dorje Chang Buddha III in the State Practice of the Supreme and Unsurpassable Mahamudra of Liberation became liberated the very day they received such dharma. Like the Mud Pill Path-Fruit Dharma, realization was attained within two hours. For example, H.E. Kaichu Rinpoche realized powers through the practice of the Vajra Substitute Body Meditation and the third stage of tummo (inner-heat) dharma. A few years ago he demonstrated his dharma powers in front of many people. An infrared heat detecting devise measured that his body temperature rose to 197.4 Fahrenheit. Each of the dharma kings and rinpoches who felt such inner-heat with their finger tried to but could not withstand the burning. Could it possibly be that those dharma kings and rinpoches gave up without even trying to withstand the inner-heat from H.E. Kaichu Rinpoche? No other person in all of Tibet and India has attained such tummo (inner-heat) and Vajra Substitute Body Meditation powers. H.H. 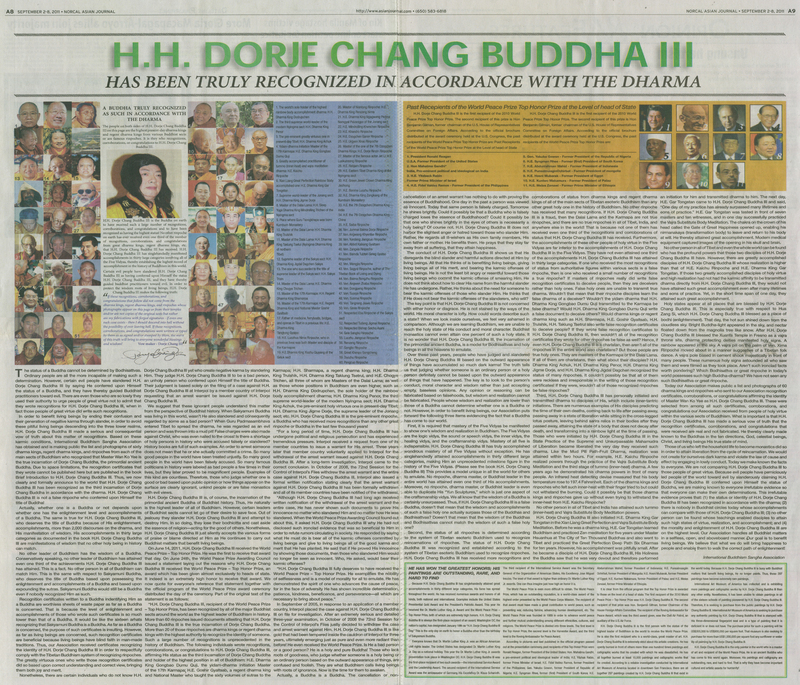 Dorje Chang Buddha III also initiated H.E. Dharma King Gar Tongstan in the Xian Liang Great Perfection and Vajra Substitute Body Meditation. Before he was a dharma king, H.E. Gar Tongstan learned Buddhism and practiced Zen meditation for five years under Master Hsuanhua at The City of Ten Thousand Buddhas and also went to Tibet and practiced the Great Perfection Deep Path Six Dharmas for ten years. However, his accomplishment was pitifully small. After he became a disciple of H.H. Dorje Chang Buddha III, His Holiness the Buddha saw that he was very devout and therefore performed an initiation for him and transmitted dharma to him. The next day, H.E. Gar Tongstan came to H.H. Dorje Chang Buddha III and said, “One day of my practice has already surpassed many lifetimes and eons of practice.” H.E. Gar Tongstan was tested in front of seven masters and ten witnesses, and in one day successfully practiced the Vajra Substitute Body Meditation. The chakra on the crown of his head called the Gate of Great Happiness opened up, enabling his nirmanakaya (transformation body) to leave and return to his body at will. He thereby attained great accomplishment. Modern medical equipment captured images of the opening in his skull and brain. No other person in all of Tibet and even the whole world can be found who has the profound powers that those two disciples of H.H. Dorje Chang Buddha III have. However, there are greatly accomplished disciples of H.H. Dorje Chang Buddha III whose realization is higher than that of H.E. Kaichu Rinpoche and H.E. Dharma King Gar Tongstan. If those two greatly accomplished disciples of holy virtue and high realization had not had the karmic affinity to be transmitted dharma directly from H.H. Dorje Chang Buddha III, they would not have attained such great accomplishment even after many lifetimes and eons of practice. Yet, in the short time span of one day, they attained such great accomplishment. Holy states appear at all places that are blessed by H.H. Dorje Chang Buddha III. This is especially true with respect to Hua Zang Si, which H.H. Dorje Chang Buddha III blessed as a place of bodhi (enlightenment). That day, the hot sun shined down from the cloudless sky. Bright Buddha-light appeared in the sky, and nectar floated down from the magnolia tree like snow. After H.H. Dorje Chang Buddha III blessed the Xuanfa Temple in Fresno as a vajra throne site, dharma protecting deities manifested holy signs. A rainbow appeared in the sky. A vajra pill on the palm of Ven. Xima Rinpoche moved about in a manner suggestive of a Tibetan folk dance. A vajra pole based in cement shook majestically in front of many people. These numerous holy signs astounded all who saw them and were filmed as they took place. Aren’t such ironclad facts worth pondering? Which Bodhisattva or great rinpoche in today’s world possesses such high Buddha-dharma? We have not seen any such Bodhisattva or great rinpoche. Today our Association makes public a list and photographs of 60 dharma kings and rinpoches who sent to our Association recognition certificates, corroborations, or congratulations affirming the identity of Master Wan Ko Yee as H.H. Dorje Chang Buddha III. These were selected from among all such certificates, corroborations, and congratulations our Association received from people of holy virtue within the various sects of Buddhism. What is important is that H.H. Dorje Chang Buddha III has made a serious vow of truth that the recognition certificates, corroborations, and congratulations that were received are real and not fabricated. He thereby clearly made known to the Buddhas in the ten directions, God, celestial beings, Christ, and living beings His true state of mind. Those of us who left the household life to become monastics did so in order to attain liberation from the cycle of reincarnation. We would not create for ourselves dark karma and violate the law of cause and effect by engaging in lowly conduct. Today we make known the facts to everyone. We are not comparing H.H. Dorje Chang Buddha III to those people of great virtue. Because evil people have perniciously led people of the world toward evil by slanderously claiming H.H. Dorje Chang Buddha III conferred upon Himself the status of Buddha, we are making known to everyone irrefutable evidence so that everyone can make their own determinations. This irrefutable evidence proves that: (1) the status or identity of H.H. Dorje Chang Buddha III has been recognized in accordance with the dharma; (2) there is nobody in Buddhist circles today whose accomplishments can compare with those of H.H. Dorje Chang Buddha III; (3) no other person can be found whose teachings enabled disciples to attain such high states of virtue, realization, and accomplishment; and (4) the morality and enlightenment of H.H. Dorje Chang Buddha III are on the highest level. Our Association handles all Buddhist matters in a selfless, open, and aboveboard manner. Our goal is to benefit living beings. We believe that what we do will bring happiness to people and enable them to walk the correct path of enlightenment! Because H.H. Dorje Chang Buddha III has singlehandedly attained great accomplishments in thirty different large categories, His fame has spread throughout the world. He has received numerous awards and honors of all kinds, both national and international. Examples include the United States Presidential Gold Award and the President’s Patriotic Award. This year He received the Dr. Martin Luther King Jr. Award and the World Peace Prize – Top Honor Prize, both of which are extremely high honors. H.H. Dorje Chang Buddha III is always the first-place recipient of an award. Washington DC, the nation’s capital, has designated January 19th as “H.H. Dorje Chang Buddha III Day.” This is the only day on earth to honor a Buddha other than the birthday of Sakyamuni Buddha. Everyone knows that Dr. Martin Luther King Jr. was an African American civil rights leader. The United States has designated Dr. Martin Luther King Jr. Day as a national holiday. This year the Dr. Martin Luther King Jr. awards presentation took place in Washington DC. H.H. Dorje Chang Buddha III was the first-place recipient of two such awards—the International Service Award and the Leadership Award. The second recipient of the International Service Award was the ambassador of Germany, His Excellency Dr. Klaus Scharioth. The third recipient of the International Service Award was the Secretary General of the Organization of American States, His Excellency Jose Miguel Insulza. The level of that award is higher than ordinary Dr. Martin Luther King Jr. awards. One can thus imagine just how high an honor it is. The World Peace Prize is even more difficult to obtain. The World Peace Prize, which has an outstanding reputation, is a world-class award of the highest order presented by the World Peace Corps Mission. The recipient of that award must have made a great contribution to world peace, such as preventing war, reducing famine, advancing human development, etc. The World Peace Prize was founded in 1989 in order to advance world peace and further mutual understanding among different ethnicities, cultures, and religions. The World Peace Prize is divided into three levels. The first level is the Top Honor Prize, the second level is the Harvester Award, and the third level is the Roving Ambassador for Peace Award. According to pictures and text published in the official program passed out at the presentation ceremony, past recipients of this Top Honor Prize were Ronald Reagan, former President of the United States; Hon. Mahatma Gandhi, a pre-eminent political and ideological leader of India; H.E. Yitzhak Rabin, former Prime Minister of Israel; H.E. Fidel Valdez Ramos, former President of the Philippines; Gen. Yakubu Gowon, former President of Republic of Nigeria; H.E. Syngman Rhee, former (first) President of South Korea; H.E. Abdurrahman Wahid, former President of Indonesia; H.E. Punsalmaagiin Ochirbat, former President of Mongolia; H.E. Hosni Mubarak, former President of Egypt; H.E. Kuniwo Nakamura, former President of Palau; and H.E. Meles Zenawi, former Prime Minister of Ethiopia. It is clear from the official program that the Top Honor Prize is awarded to those on the level of a head of state. The first recipient of the 2010 World Peace Prize – Top Honor Prize was H.H. Dorje Chang Buddha III. The second recipient of that prize was Hon. Benjamin Gilman, former Chairman of the House Foreign Affairs Committee. The recipient of the Roving Ambassador for Peace Award, which was the third award given, was the Civil Air Patrol, an auxiliary of the U.S. Air Force. H.H. Dorje Chang Buddha III is the first person with the status of the highest leader of Buddhism in the world to receive the World Peace Prize. He is also the first recipient who is a world-class, great master of art. H.H. Dorje Chang Buddha III is extremely strict about His artistic creations. He has openly burned in front of others more than one hundred times paintings and calligraphic works that He created with which He was dissatisfied. He has all together burned at least 10,000 paintings and calligraphic works that He created. According to a reliable investigation conducted by International Art Museum of America located in downtown San Francisco, there are all together 297 paintings created by H.H. Dorje Chang Buddha III that exist in the world today. Because H.H. Dorje Chang Buddha III is busy with Buddhist matters that benefit living beings, He no longer paints. Thus, those 297 paintings have become extremely rare paintings. International Art Museum of America has collected and is exhibiting more paintings and calligraphic works by H.H. Dorje Chang Buddha III than any other entity. Nonetheless, it has been unable to obtain paintings in all of the sixteen schools of painting pioneered by H.H. Dorje Chang Buddha III. Therefore, it is seeking to purchase from the public paintings by H.H. Dorje Chang Buddha III. International Art Museum of America is seeking to purchase any authentic painting by H.H. Dorje Chang Buddha III that is stamped with His three-dimensional fingerprint seal and is a type of painting that it is deficient in or does not have. The purchase price for such a painting will be US$300,000 to US$900,000 per square foot. That museum is also seeking to purchase for more than US$1,000,000 per square foot any sunflower or water lily oil painting by H.H. Dorje Chang Buddha III. H.H. Dorje Chang Buddha III is the only painter in the world who is a master of art and recipient of the World Peace Prize. He is an ancient Buddha who has come to this world again. Moreover, His paintings and calligraphy are outstanding, rare, and hard to find. That is why they have become important cultural and artistic assets for humanity!